Keep refreshed, cool and energised with our amazing cooling towel that keeps you icy cool and dry all day long. Favourite among both sports enthusiasts and outdoor workers looking for easy, instant relief from the intense heat of the sun. 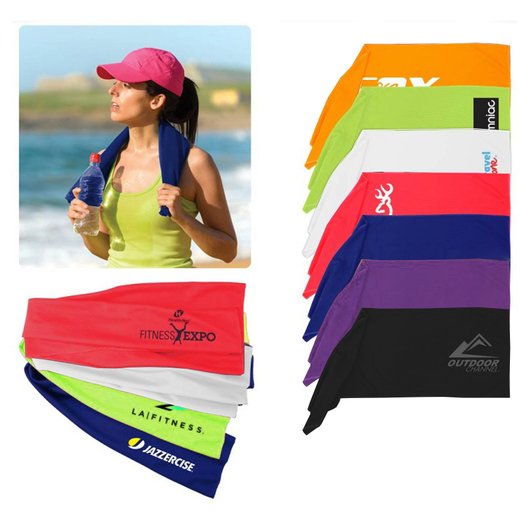 Our cooling towel is ideal for any hot day for towelling off after a Yoga or Pilates Class. Simply wet, wring, and wear, the towel allows cool air to stimulate cooling; wearing a wet towel can lower your core temperature. It is a hyper-evaporative material that is a latest in cooling innovation; this towel retains water while remaining dry to the touch to provide cooling relief.